The company’s latest service would allow ship crews, field engineers and shipyard personnel to connect with shore-based experts worldwide through real-time communication using voice-controlled Augmented Reality wearables and remote guidance software. The tests were carried out onboard the Huckleberry Finn, a RoRo ferry operated by TT-Lines, while the vessel sailed between Trelleborg, Sweden and Travemünde, Germany. Simulated service was conducted on the ship’s navigation equipment on the bridge and on the shaft line seals and bearings in the engine room. All tests met onboard safety standards and were monitored in real-time by Wärtsilä personnel located in Gothenburg and Hamburg. In order to access WiFI for video session, a portable on-deck LTE antenna was installed on the vessel. it is reported that it was able to supply a strong signal whenever needed. 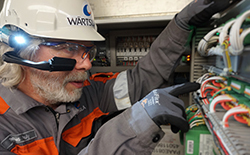 In its announcement, Wärtsilä stated the tests verified the effectiveness of the AR wearables as a means of communication. “The overall evaluation of this testing programme endorses Wärtsilä’s strong capabilities in remote guidance service," said Thomas Pauly, future technologies product manager, seals and bearings, at Wärtsilä Marine. "It’s like having a Wärtsilä service engineer onboard 24/7." These remote guidance services are a step towards the company’s larger vision of a Smart Marine Ecosystem – a system that uses smart technology to create greater efficiencies, connections and provide customers with a more holistic lifecycle management service. Other companies have also been testing out the potential of wearable technology in the maritime industry. Lloyd’s Register offers remote inspections of manufacturing sites while Kognitive Spark – a Canadian-based tech start-up – has recently partnered with the Royal Canadian Navy to help improve ship maintenance using a mixed reality headset.